Small but mighty - disc top closures from Mold-Rite Plastics have such a wide variety of applications. Walking through the local store, you can find them in nearly every aisle, from personal care, health and beauty to cleaning and automotive. What makes them so popular? Perhaps it is the sleek look that they give to a package when color combines with branding to make a product stand out on the shelf. Or, maybe it's the reliable functionality that helps customers dispense just the right amount of product without creating a mess. With options ranging from smooth to ribbed finishes, domed and flat tops, endless color combinations and possibilities and orifice sizes to fit any dispensing need, disc top closures are a great choice for both brand enhancement and dispensing convenience. On a recent stroll through the aisles, it was quite clear what a popular powerhouse this closure has become. The hair care aisle was filled with shampoos, conditioners and treatments capped with these dispensing dynamos. There were oils designed for personal care that the disc tops easily contained. Beyond hair care, bubble bath and spa treatments showcased the closures. 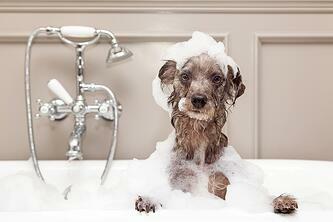 Furry friends get to reap the benefits, too. From dog shampoo and conditioner, flea and tick treatment, skin and coat treatment, to hydrocortizone lotion, eye wash and dental rinse, pets are kept looking and feeling their best with the added benefit of disc top dispensing. What pet owner hasn't been happy to have the one-hand action of a disc top closure readily available to dispense shampoo during a dog bath when the dog is all too eager to hop right out of the tub? With the disc top keeping your shampoo contained inside of your bottle, you still have one free hand to keep Fido from fleeing. The household cleaners aisle featured an equally impressive disc top display. Countertop cleaners, stain and odor remover, metal polish, cabinet cleaner - all featuring the dispensing capabilities of the dependable disc top. Automotive was no exception. So many products, so many disc tops. Scratch and stain remover, metal renewal, wax, plastic cleaner and polish, car wash - keeping your car looking its best is easy as can be. Disc top closures - dispensing the products you love to keep you, your pets, your home, and your car looking their best. 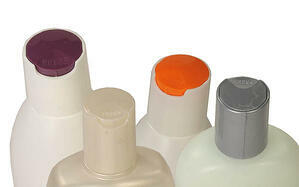 Give your product the dispensing convenience of an MRP disc top cap. Click below for more information and to request samples.